Chloe Sherman and Alex Castillo in Romeo and Juliet. BOTTOM LINE: Director and choreographer Francis Patrelle shows us that he not only skillfully puts this tragic classic together, but that he is also a generous teacher, mentor and acting coach. 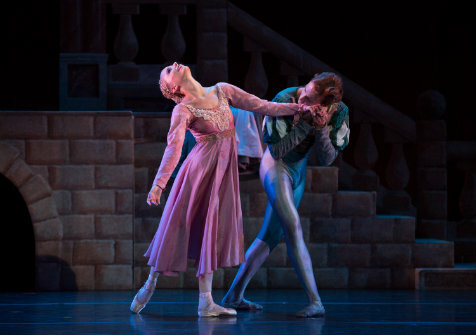 Dances Patrelle presented Romeo and Juliet at the Kaye Playhouse. All the dancers have incredible technique and facility especially Alex Castillo as Romeo and Chloe Sherman as Juliet. They are both currently dancing with Los Angeles Ballet, but have trained with Francis Patrelle. In fact, every member of Dances Patrelle is a student or former student and this shows the breadth of not only his directing skills, but of his generosity as a teacher. We begin with dancers in tattered rags during the prologue of the music representing the plague of hatred and prejudice as they swirl through the lavishly costumed dancers. Patrelle uses a large group of children playing "Ring around the Rosy" and some adults as figures of lust and vulgarity. The cat-like quality to their movement and their invasiveness consumes and torments the Montagues and Capulets and while doing so, fills the stage during scene changes. It becomes the recurring theme that pulls everyone apart. Later, we find that the plague dancers are the reason that Romeo never finds Juliet’s note to him as they apprehend and destroy the note. It always seemed to be an aggravating moment that a note would have solved. Patrelle puts his stamp of logic on it. The two dueling families show their open loathing with fresh balletic scenes juxtaposed with arms held up in fists at each other and slapstick moments where they duel with baguettes as swords. As we enter the Capulet house, the masked ball where Romeo and Juliet first see each other also becomes a canvas for more drama: Tybalt and Lady Capulet openly having an affair, Juliet obviously disliking her suitor, Paris and the three jester like Montagues -- Romeo, Mercutio and Benvolio -- doing chauvinistic chest pounding steps. When Romeo and Juliet finally meet, they sweep us off our feet as well. Every arabesque is imbued with color and tone, no doubt a strength in Patrelle’s coaching. The steps seemed to melt away and their commitment to the choreography made it feel as if they were really speaking. The second act begins at the chapel and the joy of marriage is dampened when Tybalt kills Mercutio. What follows is a long drawn out death scene that makes most of the dancers seem blind not to notice that Mercutio has been dying for the last five minutes. I was relieved when he finally stopped moving. Grant Dettling as Tybalt has a stately imposing force without being overly dramatic as the murderer and adulterer. Julie Voshell as Juliet’s nurse maid showed us that she had a saucy side and the only thing that looked old and frumpy about her was her padded costume. Her character is much more developed than in any other version of Romeo and Juliet I have seen. She even has a crush on Mercutio and flaunts her sexual prowess. All the dancers had exceptional technique that felt it was easy for them to bring intent into their roles. Often in ballets, the dancers seem to step in and out of character when technical feats are performed. Here it was easy to see that the choreography and perhaps sometimes the simplicity of it allowed the dancer’s artistry to shine through. During the third act, when Juliet struggles to take the sleeping potion, ghosts of Tybalt and Mercutio appear and they perform a trio where she tries to reconcile the past and either kill herself or take the potion. I loved that take of Juliet’s consciousness and we see that Patrelle almost has a cinematic approach to his choreography. When Romeo finds Paris grieving her death, he kills her in his state of rage. Then Juliet awakes to find her lover dead. Watching Alex Castillo and Chloe Sherman portray this scene made me wonder if somehow they didn’t love each other in real life. The hatred and the plague have killed the lovers and eaten away at the families. Finally the families unite together in their grieving. We are left seeing the dead bodies rise up and form a tableau of remembrance and peace. The end seeing them all was like the last line of a poem. A current poem at that.